"The Miller Gallery is always exciting, always challenging, and always at the forefront. 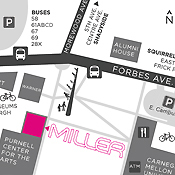 Whenever I go to Pittsburgh, visiting the Miller Gallery is a must." - Are you a female scientist? If so, read subRosa's letter, and your reply may be selected for exhibition. Since its founding in 2000 by Regina Gouger Miller, artist, educator, businesswoman, arts patron and alumna, the Miller Gallery has presented 87 exhibitions, 2394 artists + cultural producers, 168 events, in 6 cities. 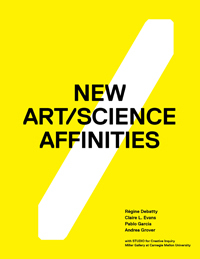 We are thrilled to announce the release of our new publication, New Art/Science Affinities, a 190-page book on contemporary artists working at the intersection of art, science, and technology. The book includes meditations, interviews, diagrams, letters and manifestos on maker culture, hacking, artist research, distributed creativity, technological and speculative design. Sixty international artists and art collaboratives are featured, including Agnes Meyer-Brandis, Atelier Van Lieshout, Brandon Ballengée, Free Art and Technology (F.A.T. ), Rafael Lozano-Hemmer, The Institute for Figuring, Aaron Koblin, Machine Project, Openframeworks, C.E.B. Reas, Philip Ross, Tomás Saraceno, SymbioticA, Jer Thorp, The Graffiti Research Lab, and Marius Watz. NA/SA was written and designed in one week by six authors and designers, using a collaborative authoring process known as a "book sprint." 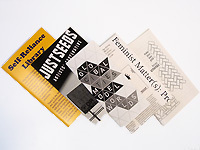 This method was adopted "in order to understand this very moment in art, science and technology hybrid practices, and to mirror the ways Internet culture and networked communication have accelerated creative collaborations, expanded methodologies, and given artists greater agency to work fluidly across disciplines," says lead author Andrea Grover. New Art/Science Affinities is part of Grover's Andy Warhol Foundation for the Visual Arts Curatorial Research Fellowship at the STUDIO for Creative Inquiry + Miller Gallery at Carnegie Mellon. An exhibition that will be the product of Grover's research will take place in early 2012 at the Miller Gallery. - More cities to be announced. The Miller Gallery at Carnegie Mellon University's presentation of the city-wide 2011 Pittsburgh Biennial features artists who work collaboratively, with projects that demonstrate the strength of collective voices in deciding the future of neighborhoods, cities, nations, and societies, and the importance of intimate conversations and compassionate listening. The exhibition unveils four new installations and two recent projects, and includes sculpture, printmaking, painting, video, publications and workshops. @ Miller Gallery at CMU, 3rd floor. @ Miller Gallery at CMU, 2nd floor. Exhibition and events are free + open to the public. - Now available at the CMU Hunt Library: Meishi Street, a documentary by Ou Ning + Cao Fei on the eviction process that took place in Beijing in advance of the 2008 Olympic Games. Donated by the CMU School of Architecture, in connection with the Pittsburgh Biennial.